You maintain a hectic lifestyle. Between work, exercise, church activities, taking the kids to ballgames, dance recitals, doctor’s appointments, etc., rarely is there enough time to take care of those forgotten projects around the house. Or maybe you just don’t have the expertise needed to complete a specific item on your “honey do” list. 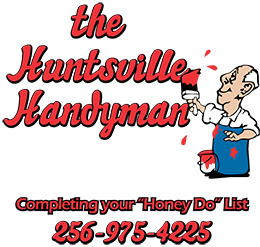 That’s where The Huntsville Handyman can help. No matter how small or large the job…whether it’s simply hanging a picture or painting your entire home (inside and out), call the professionals today for a free estimate. Steve Falzone, owner of The Huntsville Handyman, will be on every job site either working along side or supervising its progress. Steve will also be the only one to ask you at the end of the project, “Are you satisfied with our work”? 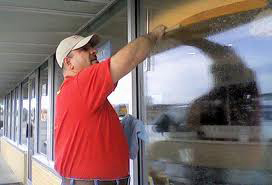 Here’s a complete list of their body of work: interior and exterior painting, light fixture replacement, ceiling fan installation, door lock and dead bolt installation, playground, shed and furniture assembly, plumbing fixture installation, re-caulking tubs and showers, bathroom renovations and repairs, tile setting for back-splashes, storage shelving solutions, caulking and weather stripping, drywall repair, picture hanging, air filter replacement, door and window installation soffit/fascia repair, rotten wood replacement, landscaping lighting (low voltage) installation, mailbox repair and installation, storm doors and window installation, screen room repairs, garage door openers, blinds and curtain hanging, minor masonry repairs…and the list goes on. The Louver Shop of North AL Ted R. Sanders Moving & Warehouse, Inc.